Updated designs for Singaporean developer Fragrance Group's controversial skyscraper near Hobart’s waterfront have been submitted to Hobart City Council as part of the development application process. The new design calls for a 179.6-metre-tall tower with an angled roof occupying a smaller footprint than the original 120-metre proposal. A 25-metre spire would take the building’s total height to over 204 metres. 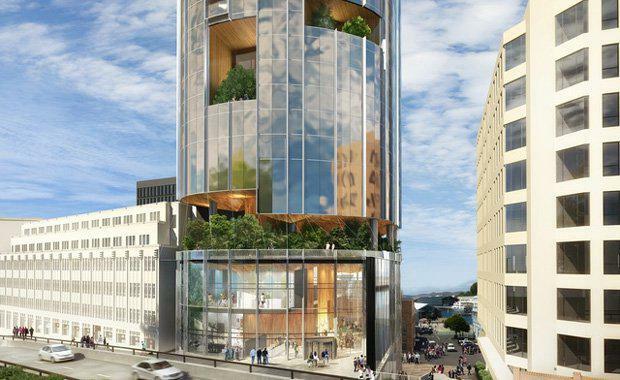 The updated proposal for a taller and narrower building also moves a series of “sky gardens” to a concentrated point on one side of the building facing Franklin Square. Speaking to ArchitectureAU on the updated designs, Xsquared Architect's Peter Scott said that the decision to move the gardens was to create a more “intimate” feeling, as well as to “give each side of the building a particular character,” creating a “signature facade” when viewing the CBD from the harbour. The architect said that the revised design of the Davey Street hotel would have reduced environmental impacts and that floor space had not increased between the two designs. The 210m tower would contain 457 rooms, restaurants, conference centre and 99 on-site car spaces. The Council is holding a public forum on proposed changes to the planning scheme. If approved by council the hotel could be operational by late 2020 according the Xsquared. Fragrance Group is also planning a second hotel development on nearby Collins Street. The tallest building currently in Hobart is the Wrest Point Hotel Casino which stands at 74 metres and is likely to be refurbished. 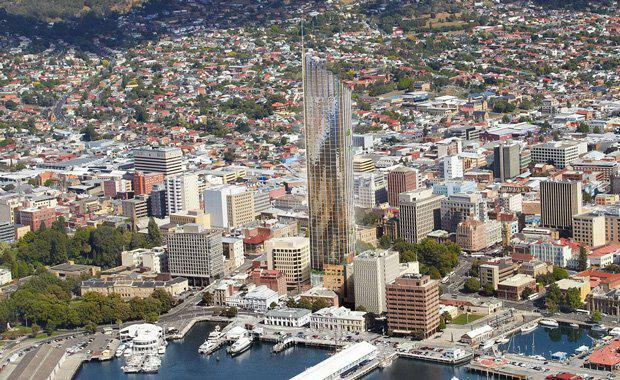 Hobart City Council planning director Neil Noye said he was surprised when the Fragrance Group submitted an application increasing the height of the building with the addition of a 24 metre spire. Noye said the council was obliged to consider all applications. Meanwhile, a meeting of more than 400 people in the Hobart Town Hall urged Council to stick to the height limits reflected in current planning schemes. The council has 31 days to respond to the Fragrance Group's plans.